The other day I ran a complete sales history report on BMT Micro, the payment provider I use for my games on Grey Alien Games, and noted that the total revenue had just gone over $1000. I first set up my website for direct sales in mid-December 2006 and it’s now 43 months later. So that’s an average of $23-something a month. So you must be thinking, “wow that’s a really crap amount of money to have made from direct sales”. And you’d be right! That’s because almost all of my sales and money as an Indie has come from portals (well over $100,000). I don’t actively market my own website or use my newsletter email list etc. but I still make a few random sales a month, which is nice. The portals are powerful sales vehicles for certain types of games – casual games – which is of course the type of games that I made. The point I’m making is that direct sales are not necessarily the holy grail. In fact I’ve made nearly $1000 from Google Adsense on my website, and I’ve made $4400 from selling advertising on my website, and I made nearly $2000 from affiliate sales (and this would have been more if I didn’t have to shut it down due to a non-compete clause.) I’ve even made 100 Euros for writing a blog post. There are many ways to gain an income once you have an established website/blog with traffic. If I started making non-casual downloadable games, then for sure I’d really go all out to make direct sales work. But if I made iphone, Flash or console games, then my site would merely be a marketing vehicle for such games – in fact these days I’d say that social media probably has more of a marketing impact than an plain website. One last thing to consider: $1000 is more than $0. It shows that people do like to buy my games, and that I must have got something right. Many Indies struggle with even making $50 from their first game. But don’t give in, keep refining each game, and keep improving your marketing, and you’ll get there! How are your direct sales doing? 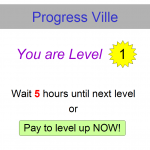 Progress Ville – New Facebook Game! I’ve spent a *long* time analysing Facebook games, working out what makes the good ones successful, and I’ve finally condensed all that knowledge into an awesome next-gen Facebook Game 2.0. Behold my new Facebook Game that will shove Zynga off the top spot: Progress Ville! Stay tuned for more incredible insights. You are currently browsing the Grey Alien Games weblog archives	for July, 2010.